What kind of animal could a centaur ride, and how? Let's be using your typical centaur: half man, half horse. Due to the nature of their legs, they can't ride animals in the way that humans do. Horse legs just aren't really made to do that. My question is, what kind of animal could I use or create for them to be able to ride, and how would they mount and ride it? It has to be at least semi-comfortable for the taurs, and be able to carry a heavy load over long distances. EDIT: The technology in this world is pretty much dark ages technology. 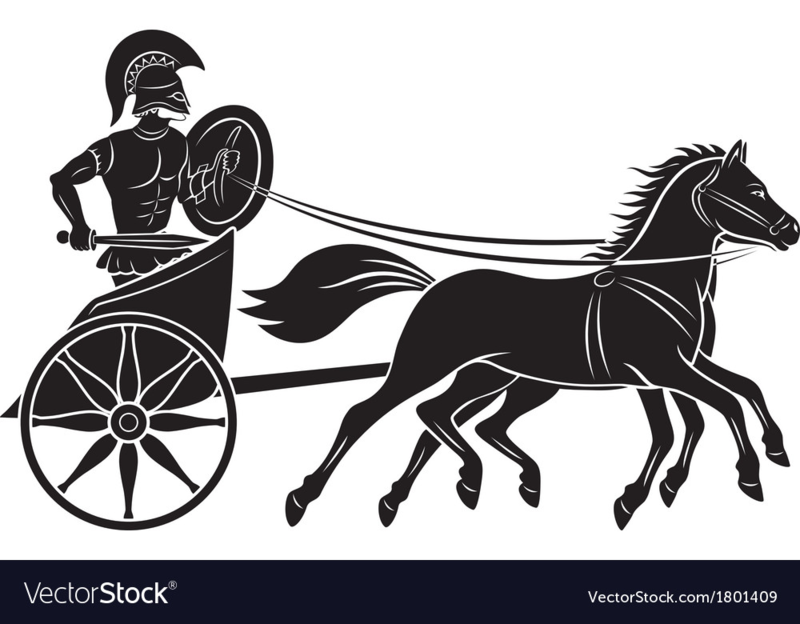 Others have suggested carts but I will go one step further and suggest chariots. Chariots only have two wheels so they can handle terrain that carts can't. They can be designed to fit just one centaur (with a cart, the centaur(s) would be knocked around a lot) and have firm railings to grab on it (like the ones made for humans have). Or they could fit 2+ centaurs and/or baggage. They can be pulled by one or two (some pictures I'm seeing show up to 4) horses, other centaurs, oxen, etc. It makes perfect sense to me that even someone who is strong and healthy and built for speed and distance would need a break from traveling, or might need technology to help out for a great journey. 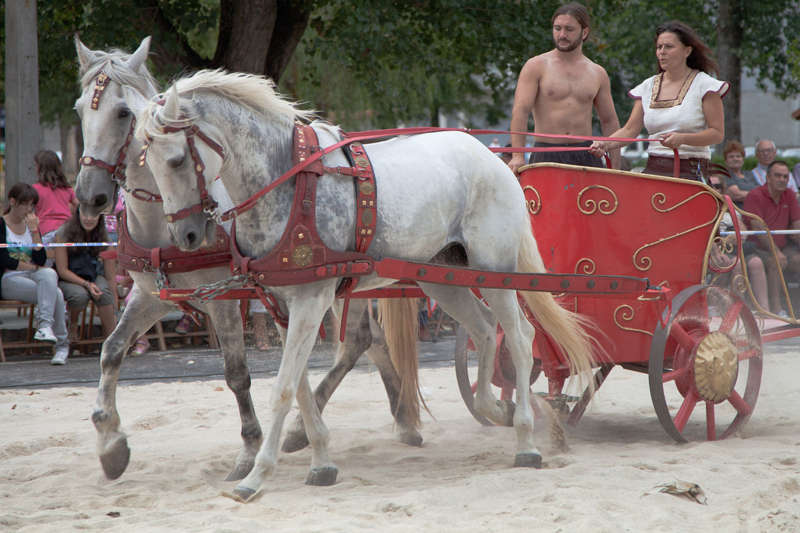 And while I don't know the size of the centaurs, here's a picture of the original Greek horses that used to pull actual chariots. One would fit nicely into the chariot in the photograph. Since we're considering centaurs I feel free to invent a creature. Let's start with this charming little guy. 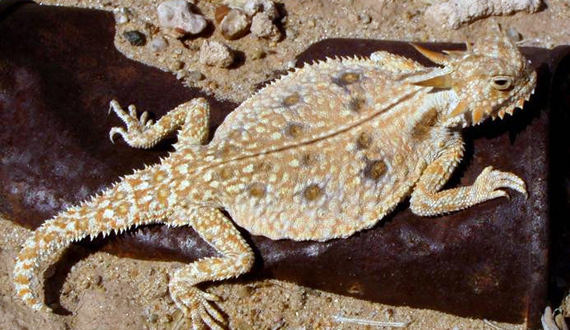 I give you... the Texas Horned Lizard (Source). Lizards can really haul the mail. They're sleek, fast, good jumpers, and notice almost everything around them. That charming little tyke is a bit small for our purposes, so let's modify him a bit. He needs to be the better part of 7 meters nose-to-tail. He needs to carry a bit of weight — 675 Kg worth of centaur plus whatever is reasonable for them to carry with them. Let's give him two extra feet (6 legs). His broad back is a great starting point, but let's provide a bit of an evolutionary convenience. Rather than one spine down the middle, let's give him two spines for strength and flexibility. The result is a hammock in the center of the back that's just right for a centaur to lie down in. 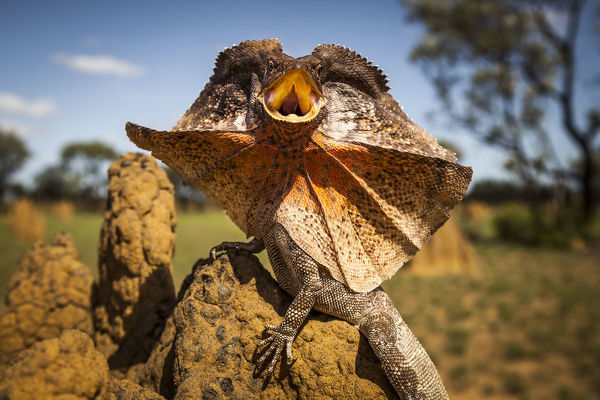 And if you really want to amp this up a bit, give him a Frilled Lizard's neck flap. It not only scares the crap out of people, but it provides remarkable protection for the centaur (if a bit of visibility hindrance). (Source) Remember, 7 meters long, six legs, that flap would be reasonably naturally armored. I definitely wouldn't want to be the fool facing squad of these beauties. The sheer weight of a centaur's body would make travelling 'piggy back' for any appreciable distance very uncomfortable. I suggest a specially-designed sling with leg holes to support the passenger. They could then be supported between two draft horse. The carriers work one at each 'corner'. A horse and carriage would work well - again with a specially designed sling. How about Elaphas maximus, Loxodonta africana, or Loxodonta cyclotis? The centaur could ride up an adjustable ramp to the back of the Elaphus or Loxodonta and then stand or lie down on the back. Or the Elaphus or Loxodonta could get down on all four knees with its stomach on the ground and the centaur could climb onto the back before the Elaphus or Loxondonta stood up. Might seem glib, but it’s the best I’ve got. 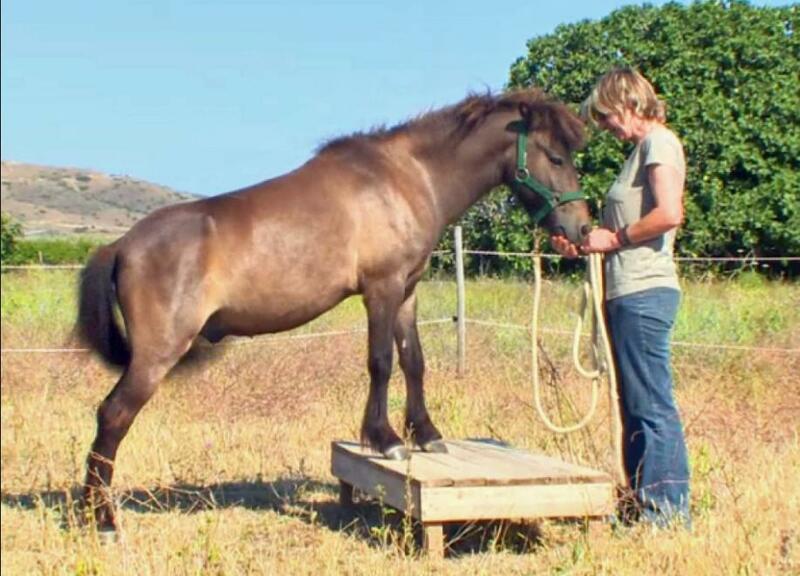 If your centaurs are relatively small then straddling the back of a large breed (A shire horse of some kind, or a Clydesdale ) that is bred for carrying large loads with. Out. Stopping. Is probably your best bet. They’re relatively simple to mount if you have some wooden blocks and can be ridden much as a human rides a jet ski (knees tucked up at the sides) to keep the weight distributed nearer their hips and shoulders. As far as speed over distance goes they can plod away for ages without needing to stop. They were bred for it, after all. Presumably your half-horse horse breeders will be even better at breeding for big, strong, fast horses, eventually getting back to something more like medieval era warhorse breeds. The mythical Roc is a pre-made mythical creature that specifically carries cattle around. If such creatures exist in your world it seems reasonable that centaurs might seek them out to use as "mounts" of a kind, though admittedly upside-down to how we normally think about mounts. 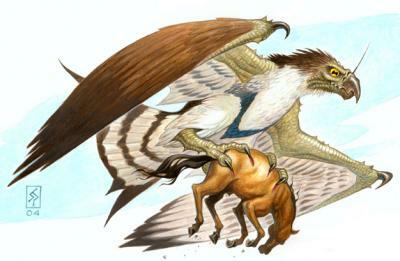 Many similar creatures to the Roc also exist that could serve a similar role, such as the Phoenix, Thunderbird or Griffin. You can always make your own of course. Of course the roc is almost entirely infeasible without magic as we can see here:What is the maximum size of a flying creature? That being said given that they are a pre-existing magical creature like the centaur and so will be slightly more acceptable due to that fact. While the journey won't be tremendously comfortable for the centaur, the speed of flight will make it shorter and thus more bearable. Much in the way that people are willing to endure the cramped conditions of economy class rather then spend a week going by ferry. A leather (or linen if leather makes centaurs understandably uncomfortable) harness could be employed to make the journey more comfortable. If you want futher story ideas the Roc could follow in the mold Tolkiens Eagles and be sentient creatures that the centaurs must negotiate with in order to obtain the services of. In Egypt, canals date back at least to the time of Pepi I Meryre (reigned 2332–2283 BC), who ordered a canal built to bypass the cataract on the Nile near Aswan. Whales are trained using a system of reward (called "positive reinforcement" by trainers) by giving the killer whale food or other reinforcement when they are successful, and withholding it when they are not. Secondary reinforcement—things not essential to life, such as play time, tactile rewards and fun games—can also be used as rewards. Over time no doubt the ingenuity of the saddlers in your era would have designed a suitable way to mount the animal - but perhaps this would necessitate the removal of the dorsal fin just as the beast reaches it's forth month of life - the permanent mark of ownership/attachment to a master. Male sheep, cattle, goats and pigs are routinely castrated in order to reduce aggression and subsequent injury. This may result in reduced agression without the need for harsh punishments, but what if not everybody had their mount's temperament soothed in this way - that would make for the most dangerous of encounters - leaving you with the dilemma - to live with an agressive mount in the knowledge it'll be able to hold it's own in a fight? - or to have the beast tamed this way and keep your head down, hoping for no such agressive encounters? Not the answer you're looking for? Browse other questions tagged centaur mounts or ask your own question. What is the maximum size of a flying creature? Could a Human Ride a Raptor? The Centaur--Let's Get Real, Shall We? How Could a Human beat a Centaur in a Fight? How big would a giant pig need to be in order to carry a 10-foot tall humanoid on its back? biologically speaking, what would a centaur and human hybrid be like? What would centaur chairs look like? What animals would a sedentary centaur civilization domesticate?